Bracted Strawberry is a member of the Rose Family. It is a creeping plant with flower stalks to 2 inches tall and dark green elliptical leaves which grow in three's to 3/4 inch in length and have toothed margins. The plant typically grows in coniferous forests at elevations between 7000-9500 feet. The fruit of the Bracted Strawberry is eaten by birds, and mammals (including humans). 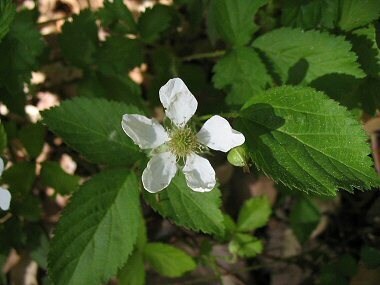 Bracted Strawberry typically blooms between May - September and produces white flowers with 5 petals to 1 inch in width with a yellow center, followed by a 3/4 inch long red, cone-shaped berry.